One of the loveliest places to visit in Paris, especially for those who are lovers of modern art and beautiful things in general, is the very original and somewhat extravagant Pompidou Centre. By buying tickets on-line, you will be able to visit the entire building without having to stand in the tedious queues at the entrance to the building. 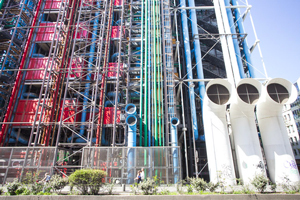 It would be impossible not to notice the Pompidou Centre, a magnificent building that is truly one of a kind. It is situated in the heart of Paris, more specifically, in one of the most typical neighbourhoods in the capital, Le Marais. Coloured tubes, ventilation shafts and exposed cables contribute to the unusual exterior facade but the best thing about this amazing building is what waits to be discovered inside with numerous modern and extraordinarily innovative works, a library and areas in which to relax. In addition to all this, it is also possible to visit the panoramic terrace and enjoy the vistas that will take your breath away as you view the city of Paris from on high. In order to avoid the queues at the ticket counters, it is really advisable to buy your tickets on-line. The security controls prior to entering the building are compulsory. However, for those who have tickets which have been purchased on-line, there is a preferential queue in order to pass through the security checks more quickly. Our advice, so as to enjoy your experience inside the museum to the max, is to start your visit from the top floor! The items on display are exhibited in chronological order so that visitors have the opportunity to witness the course of artistic development throughout the 20th century. On this tour, you will be able to see works by some of the world's great artists such as Picasso, Man Ray, Chagall, and many more. On the day of your visit, just show your tickets on your smartphone in the preferential queue outside the Centre Pompidou building. The Pompidou Centre is located in one of the most typical neighbourhoods in Paris, namely, Le Marais. You will get the chance to discover this wonderful part of Paris thanks to a specific itinerary that you can find on the page Le Marais. If you are looking for additional information regarding the history of the Pompidou Centre, the works it contains and how to get to the building using public transport, you can check out our article entitled "The Pompidou Centre. ".